This was taken at Betty's 40th Anniversary party. Cory is from the Daily News and was here to interview Betty and Jackie. Jackie was the person that hired Betty 40 years ago. 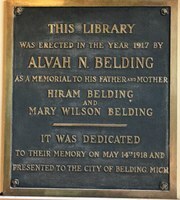 The photo board depicted Betty over the years at the Belding Library.